Widgets are a powerful feature of WordPress that allow you to easily add dynamic features to your site sidebars like tag clouds, a list of authors on your site, links to other resources, search forms, and social media features. Sometimes, though, you only want a widget to appear on a specific page of your site and by default adding a widget to a sidebar will make it show up everywhere. Activating the Display Widgets plugin on your site will allow you to control where widgets appear. 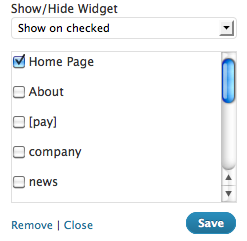 Once activated, your widget settings screen will contain a list of pages with checkboxes. You can choose to either show or hide each of your widgets on the selected pages. With this, you can do things like tailor a list of resource links to a particular topic page, or only show your Facebook like button on the homepage. This entry was posted in LIS Staff Interest, Middlebury Community Interest and tagged plugin spotlight, WordPress on January 18, 2013 by Ian McBride. Thanks for this series, Ian! It’s so helpful. I added links to it to the wiki page on WordPress. I’ll try to keep doing that as you continue to post!